Rumi’s first meeting with Shams-i Tabrizi turned him literally upside down, because of the mystical shock he experienced in their first encounter. The stranger from Tabriz was no ordinary person; he was a gifted mystic, also known as Kamil-i-Tabrizi. He had attained extraordinary esoteric abilities on the path of ‘ Salook’, the journey to seek nearness to God ). Salook, a most cherished goal of all mystics is achieved through completely submitting one's ‘self” (nafs) to the Most High to the point where it can mirror in its purified depth the reflection of the Reality and Power of the Most High. Rumi, in his late thirties was a jurist of the first order with accomplishments in religious sciences, including Quran, tradition and fiqh and was leading a loyal Muslim community in Konya in Eastern Iran, then called Khorasan, now Turkey. His fame as a theophosopher, it appears had traveled beyond his area to Damascus and Allepo, two major centers of learning where Rumi had also traveled to fulfil the academic requirements of a Faqih or Jurist. 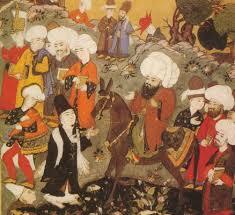 Rumi had, it appears, attained an honorable position among is peers. But there was a certain feeling of unfulfilment, disquiet, an emptiness, an appetite, a craving, a yearning, a desperate need to go beyond the worldly state, to the world unknown, the world beyond, the higher hemisphere, the domain of the Most High that even angels fear to tread. He knew he could not do it alone. He was in need of a spiritual Guide, a Mentor, skilled in the metaphysics of the intended ‘ space travel ‘, a consummate pilot who can help navigate this flight into the higher realms of existence. Shams Tabriz, a man probably in his sixties, having accomplished himself in religious sciences had studied under different teachers in Tabriz. He had however epitomized his skills on the path of ‘ salook ‘ under the guidance and tutelage of an accomplished teacher and a great mystic of the time, known as Baba Kamal Jundi. He spent more nearly 12 years with this skillful teacher in Tabriz. They secluded themselves in ‘ chillas ‘ ( a mystic exercise, praying for 40 days in total seclusion, seeking His Grace). Once when Shams told his teacher that he had so much on his chest to share with others but he could not say it words. the great sage, Baba Kamal told him that he was going to meet with a person who was to become his ‘tongue', or alter-ego. Led by a dream, Shams set out on a journey to Allepo and then to Konya where he finally discovered the pal he had been looking for. The legend goes that Rumi was sitting by the water ( a pond) with his students and a pile of books when Shams walked in as a wayfarer with dishevelled hair, After greetings, he asked Rumi pointing to the books (manuscripts) what was it. Rumi answered interrogatively ‘ what would you know ? ‘ The visitor reached for the the pile of books and threw them in the water. These were Rumi’s hand written manuscripts and he was greatly upset by the unexpected rage of the unknown man. Shams bent down to the water, restoring the pile of books with no sign of water on them. A bewildered Rumi managed to ask, “ what was it ? “ and Shams answered him back in Runi’s own words, “ What would you know ? “ and left. That was it. Rumi threw away his religious raimant and his hat chasing after Shams. Rumi found him at the house of one Salahuddin Zarkob where he went in total seclusion in a room for six months. Only Salahuddin was allowed to go in. Rumi came out a totally changed person. He danced around reciting poetry in Persian. Another version regarding the first encounter of Shams and Rumi relates to the verbal exchange that happened, when an old darvish stopped Rumi on his the way to the mosque and abruptly asked him: “ tell me, who is greater Ba-Yazid Bastami or Mohammad(s)? “ Rumi answered, "Mohammad (s) is the best among God’s creation, how can you compare him to Ba-Yazid who was only a scholar ? Shams replied: The Prophet says” Ma arafnak-e haggah marefetek” i.e. I am incapable of knowing You(God) the way You deserve it, whereas Ba-Yazid declares “ Sobhani maa aazaama shaeni”? (Oh what I have achieved in knowing Him!). Rumi, who was essentiallay a man of Sharia at the time wondered and asked Shams to provide the answer. Shams added :The difference is on account of each person’s capacity. Mohammad (s) had an unlimited capacity to drink from the river of Ma’arefat (gnosis or knowing God), but Ba-Yazid had yet drank only a glass of that ‘ wine ‘. Shams-i Tabrizi’s answer to the question overwhelmed Rumi and leaving his disciples, he pursued the visitor to one Salahuddin’ house.They went in isolation for forty days; Mowlana Jalal uddin Rumi was transformed during this period. This was in 1244 AD. Shams stayed with him for less than two years when upset by the hostility of Rumi’s disciples, spearheaded by Rumi’s own son, Alauddin , one day Shams left unannounced. Rumi was greatly upset by this separation. He danced around spontaneously uttering verses in ‘ firaq ‘ (separation) with his Master, his students recording the muse. This valuable wealth of mystic poetry, about 50,000 vreses, are preserved in the form of what is known as Divan-e Shams Tabriz. Rumi uses Shams as nom-de-plume in the poems, not mentioning his name anywhere, such was Rumi's dedication. His sense of total identification with his Mentor and Teacher thus reached a point of a total annihilation, for a full ‘ettesal’ (merger) with the Murshid (spiritual Master). On learning that Shams had been seen in Damascus (Syria), Rumi sent out his son, Sultan Valed with a letter, begging him to return; he also expressed in the letter, deep regrets and repentance from his followers. Shams returned to Konya and was received there with great respect. The mystic meetings resumed, Shams-e Tabriz often sharing his profound thoughts and vision with Shams and his disciples. The jealousy and anger, however, resurfaced soon among Rumi’s disciples, the jurists (mullas) of the town also joining hands with them this time. Shams left suddenly one day, without leaving a trace behind. That put Rumi in a mystic frenzy. He danced around in the street, the madresa and the gardens uttering spontaneous songs that led to his holding regular ‘Sama’ (dancing prayer) meetings with his disciples joining him ( now known as the dance of the whirling dervishes). In the beginning, Rumi always addresses Shams-i Tabriz but eventually in his spiritual quest for the lost companion, he annihilates himself and finds Shams in himself; in his later poetry, it is Shams who is talking (true to the prediction of Baba Kamal), thus Rumi becoming an extension of Shams, his alter-ego. A fascinating story of the two extra-ordinary human beings!